Madison Square Garden, New York, NY — It wasn’t the type of overwhelming revenge that Cotto’s fans had in mind, but the reigning WBA junior middleweight champion from Caguas, Puerto Rico still got his hand raised, kept his belt, and got the doctor-ordered TKO 10 win over hated rival, Antonio Margarito (38-8, 27 KOs) in front of a rabidly pro-Cotto crowd at MSG. 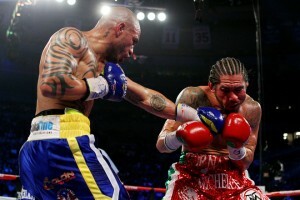 At the time of the stoppage Cotto was ahead on all three judges’ scorecards by scores of 89-82. Three division world titlist, Miguel Cotto (37-2, 30 KOs) exercised a few demons with his win and spoke in the post-fight interview as if a weight had been lifted off his shoulders. 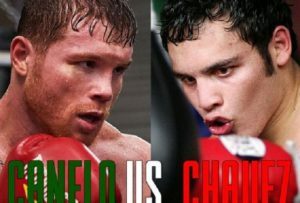 The fight, itself, was a near-duplicate of their first encounter in 2008, with Cotto moving and Margarito charging forward, looking to bury the defending champ with waves of relentless pressure. However, the difference in this rematch may have come down to two key intangibles– Margarito’s damaged right eye and the absence of possibly doctored hand wraps. The former ended up being a real factor that directly brought about the end of the contest when Margarito’s surgically-repaired eye was bloodied, swollen shut and, according to the ringside physician, without sight by the tenth round. The latter issue of the hand wraps also turned out to be a real factor, whether Margarito used them in their first bout or not. Cotto, convinced that only tape and gauze rested below Margarito’s gloves in this rematch, absorbed his opponent’s punches better and that psychological edge allowed him to keep his composure in the face of the increasing pressure of a hard-charging Margarito. Whether Margarito actually wore doctored hand wraps in their first fight will never be known, but the fact that this bout was definitely without any cheats or shortcuts, allowed for a greater degree of confidence and focus from the Boricua champion. At the end of the day, Cotto’s precision punching and movement was enough to get him the win and put his 2008 submission to Margarito behind him. Whether Cotto has much of a career post-Margarito still remains to be seen, but tonight, Cotto will rest easy. –Brandon Rios (29-0-1, 22 KOs), even a weight-drained version of himself after going through hellish 28-hours of trying to make the lightweight limit, was ultimately too much for the UK’s John Murray (31-2, 18 KOs), who eventually succumbed to a ferocious beating via TKO in the eleventh round. At times, Rios indeed fought like a fighter who had eaten little, if anything, over the last four days (as his team claimed), but the edge in class and technique still became obvious as “Bam Bam” picked apart and gradually ground down a game, but overmatched Murray. The Brit had his moments and kept the bout even through six, but Rios’ body work and precision punching left welts on each side of Murray’s body and turned his face into a mask of purple and blood-red. Murray would be deducted an ultimately meaningless point in the seventh for a low blow, but the illegal shot wouldn’t stop Rios from catching his second wind and stepping up the pressure. 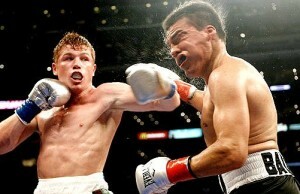 Rios’ relentless aggression would eventually drain Murray’s resolve and force a referee stoppage in the eleventh round. — Delvin Rodriguez (26-5-3, 14 KOs) avenged his brutal majority draw with Pawel Wolak (29-2-1, 19 KOs) last July with a solid, professional unanimous decision win by scores of 98-91, 98-92, 100-90. In this contest, Rodriguez used his reach advantage and greater overall skill set to negate Wolak’s single-minded, come-forward aggression. Rodriguez would box on the outside when possible and, on the inside, hit first and find a way out. Wolak did well in spots, but could never overcome the disparity in skills. The Boxing Tribune scored the bout 97-93, also in favor of Rodriguez. — Mike Jones (26-0, 19 KOs) looked sharp and every bit the part of a top five welterweight against veteran Sebastian Lujan (38-6-2, 24 KOs) in winning a one-sided unanimous decision in their 147 lb. IBF welterweight title eliminator. Jones used his height and reach advantage well, scoring solidly against his awkward opponent from Argentina and dictating the pace throughout the contest. The judges’ scorecards reflected the true nature of the bout with scores of 119-109, 119-109, and 118-110 in favor of Jones. The Boxing Tribune also scored the bout 119-109 in favor of Jones.